Konami just revealed a release date for gorgeous 3DS RPG Beyond the Labyrinth, and bundled in a load of new 3D screenshots too. The game — developed by experienced RPG studio tri-Ace — will reach Japan on 19th January, and follows a mysterious and anonymous white-haired girl as she chances upon an ancient sealed magic. There's been no announcement of any Western release plans for the RPG, so we'll have to sit tight and enjoy these 3D screenshots below to take the edge off. To see a screenshot in 3D, load up this page in your 3DS browser. Hold your stylus over the images below until they load up in the top screen in glorious three dimension-o-vision. I keep getting "This image cannot be displayed." If this doesn't come outside of Japan, I'll scream! Correction: Still getting the message on the first two pictures. The rest is working. Oh boy! More fuel for the Rainfall fire! Just what we needed! ive been negative towards nintendo lately. but this one, this is why i stick to the 3DS. im looking forward to this one for sure. If this does get a western release, I won't be getting it. 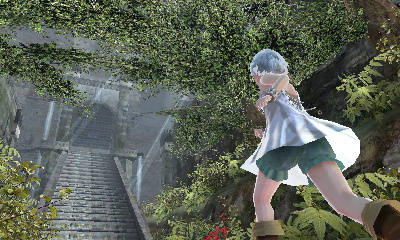 Firstly, its a first person rpg and I don't like those sorts of rpgs, it may not look it in the screenshots but you don't actually play as that white-haired girl, she just assists you and is the only one of the main characters that you see on screen. The other reason is because from what I've heard, all the story is, is that you play as a group of people trying to escape a labyrinth with the help of the mysterious girl thats been in most of the screenshots and thats pretty much it. Waiting on some real games for the 3DS, my opinion, is really irritating. Mario is good, but I would choose a great fantasy RPG/Adventure over him anyday. Looks good, graphiclly. I'll be watching this. Not to sound like a Big N fanboy, but those screenshots prove all the HD fanboys wrong about what the 3DS can do. I hope it comes State-side! @4 Even after clearing the history and cookies, I'm having the same issues viewing the images in 3D. The game certainly looks flashy enough. The premise sounds a lot like a dungeon crawler like Etrian Odyssey, except action based? Also, is this the first article to actually have the 3D picture option enabled? I've been able to see screenshots 3-6 on my 3DS (in 3D), but for some reason, the first two aren't working. She's This is pretty. I do want her the game in my bedroom 3DS. I'll keep my eye on this. I am extremely impressed by the looks of this game. I really hope that it comes westward someday. The sooner, the better. Yeah, the first two screenshot didn't work for me either. Hopefully more 3D screenshots from other games will find their way to us in the future. Even more 3D trailers wouldn't hurt either. The game looks good so far so i hope it will make its way to the entire western market. @mariofanatic128 (11. ): What if there's a really good story about the girl ? You're not interested in that ? I can smell a lot of flashbacks maybe à la Lost here. Gorgeous~!! They better localize this one!!! Really the first two on my screen seem fine..
@battletoad You could be right but even if you are, I still won't get it as it's a first person rpg. @mariofanatic128: But you would play a free demo of the game if there was one, wouldn't you ? How is this fuel for Rainfall? This isn't Nintendo's game. We can't just, from now on, blame every RPG that doesn't make it to America that just happens to be on a Nintendo platform on Nintendo! I need this game badly, I don't care if it's boring. I can't hate something this beautiful. @battletoad I might but I doubt this game would change mys dislike for first person rpgs. The graphics do look very nice though. There's been no announcement of any Western release...I am getting real tired of reading those words on this website.